Former Brazilian President Michel Temer Arrested On Corruption Charges Former President Michel Temer was one of several political and business leaders arrested on Thursday, accused of misappropriating funds in a construction graft scam. Former Brazilian President Michel Temer, pictured in 2018, was arrested Thursday on corruption charges. He faced similar charges of bribery in 2017, during his brief stint in office. The 78-year-old denies any wrongdoing. Former Brazilian President Michel Temer was arrested in Sao Paulo on Thursday as part of a sweeping anti-corruption investigation years in the making. Temer, who left office less than three months ago, faces 10 counts of corruption, according to The Washington Post. Prosecutors allege the 78-year-old was the leader of a "criminal organization" who misappropriated more than $470 million in funds "as part of a scheme related to the construction of a nuclear plant complex," Reuters reported. He is the second former president to be arrested in the ongoing "Operation Car Wash," a sprawling corruption probe that has ensnared dozens of Brazil's most powerful politicians and businessmen accused of paying or accepting millions of dollars in kickbacks since 2014. Former leftist President Luiz Inacio Lula da Silva was convicted of corruption and money laundering in 2017. He is now serving 12 years in jail. Temer's former Minister of Mines and Energy, Moreira Franco, was also arrested Thursday morning, as well as eight others allegedly connected to the bribery scandal, O Globo reported. According to the newspaper, the Federal Prosecutors Office alleges it is possible to demonstrate that money diverted from public coffers were illegally used to pay for renovations at the home of Maristela Temer, the former leader's daughter. A small group of protesters gathered outside of the Federal Police Superintendent's office in Rio de Janeiro, awaiting the ex-President's return from Sao Paulo, chanting "thief" as he arrived. Temer has repeatedly denied any wrongdoing. 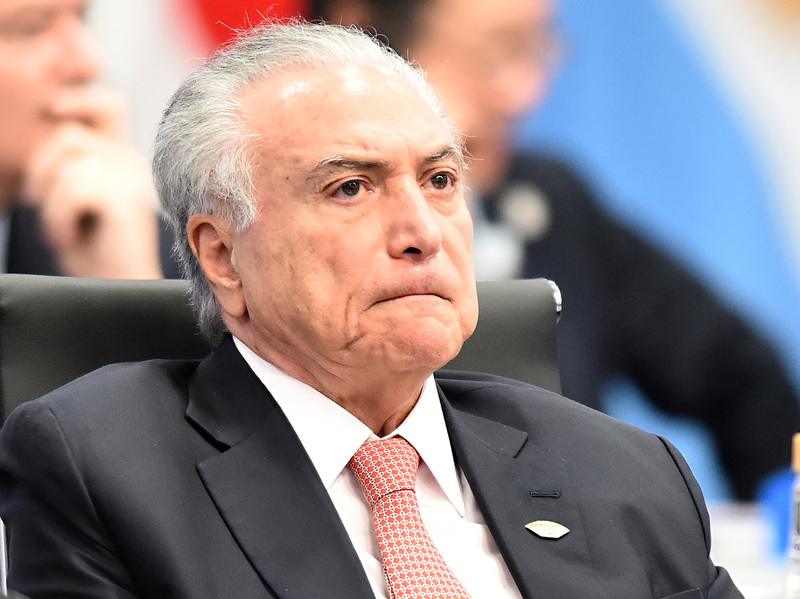 His two-year administration was plagued by scandal and Temer himself was hit with corruption charges in 2017, shortly after assuming the presidency from Dilma Rousseff when she was impeached and removed from office for mismanaging the federal budget. At the time, Temer was accused of accepting a $150,000 bribe from a food-packing executive. Prosecutors also claimed to have a recording in which he agreed to pay a jailed politician hush money. But the case never went to trial as the charges were blocked by his political allies.